Addicting. Seriously. Try it and prove me wrong. The goal of the game is to remove all the cards in the blue, cards in the yellow are just helper cards. Jokers remove all cards. How do you remove cards you might ask? Well combine black suit card values (Spade and Club) with red suit values (Heart and Diamond) to add up to Zilch! So as an example, combine a black King (value of 13) with a red 8, 2, and a 3. Make sense? The app helps you by showing the current values of the cards you have selected, and even turns green when you can remove the cards! Trust me, this game will be tough to put down. Here's a few other tidbits of info. 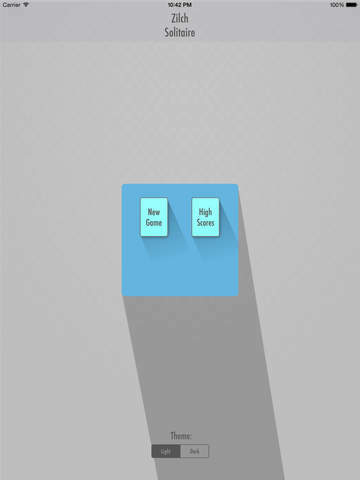 The game saves your high score to Game Center so you can compare against your friends, and the rest of the world. Have multiple devices? 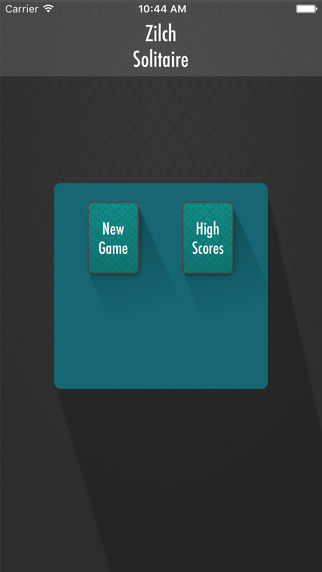 The game will pull down and sync your high score across all your devices, so you don't have to worry about it. Also, it supports the new split screen multitasking feature for iPads, so while you browse the internet, you can leisurely play Zilch too! The game was thought up on a road trip. My wife helped narrow down the rules, such as how many piles, number of cards in each pile, what the jokers do, you know, the majority of the game's rules. However the game was designed to be able to be played with an ordinary deck of cards on your own!